Click here for a FREE, 90-day trial subscription to our PSW Report! With Wednesday’s big rally, we are now seeing even more extraordinary numbers. 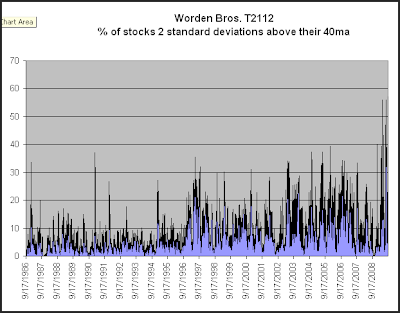 Not only is T2111 up to 58.51%, but T2112, which measures the % of stocks trade at least 2 standard deviation above their 40-DAY moving average, is also in record territory. It is showing that a remarkable 57.19% of stocks are now stretched far above their 40-ma’s. The action in T2112 truly exemplifies the uniqueness of the rally since March. Below is a long-term look at the indicator. Note that from 1986 through 2008 the highest reading this indicator ever registered was 37.22% in November of 2004. That record has been blown away repeatedly over the last 6 months. Let’s now zoom in on this year to better see what I’m saying. There simply is no comparison over the last 23 years to what we are seeing in this recent rally. 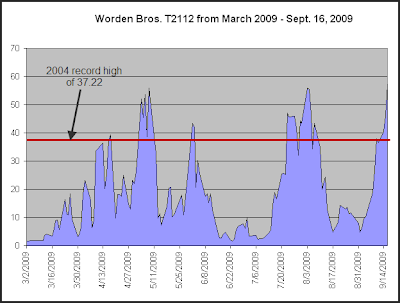 There have now 5 distinct periods in the last 6 months where T2112 has rallied through the old high. And now we’re seeing the most extreme breadth numbers of all.